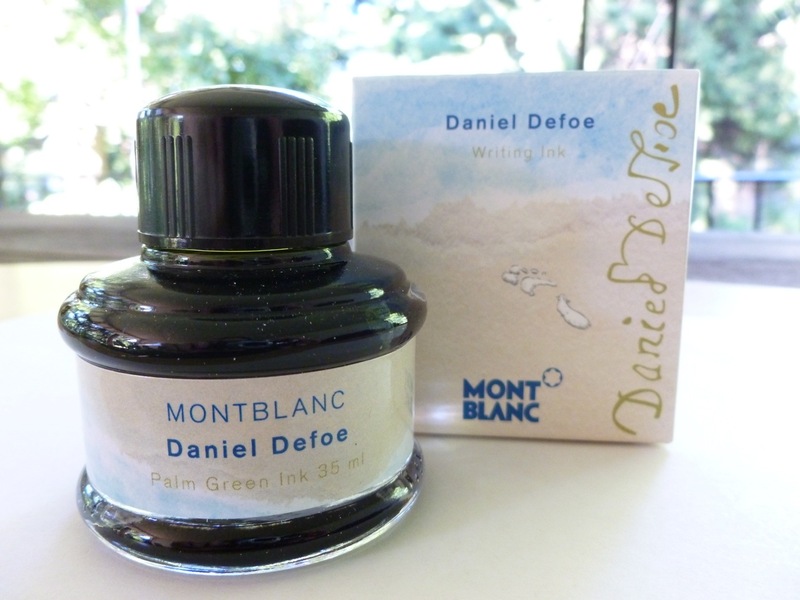 Many thanks to the fine folks at Pen Boutique for providing this bottle of Montblanc Daniel Defoe Palm Green ink for review. There are no affiliate links in this post and I was not, nor will I be, monetarily compensated. This review reflects my experience with, and observations of, the ink. We tend to think of the grass as merely green. Same goes for the trees. During my walk yesterday I noticed just how many different shades of green there are in the fields and lawns and trees along my route. Pale fresh greens, darker mature greens, and just about every shade in between. Yellow greens in the grasses. Bluish greens in the pines. Too many greens to name or count. To call the trees and weeds and lawns and fields merely green would be selling nature short. 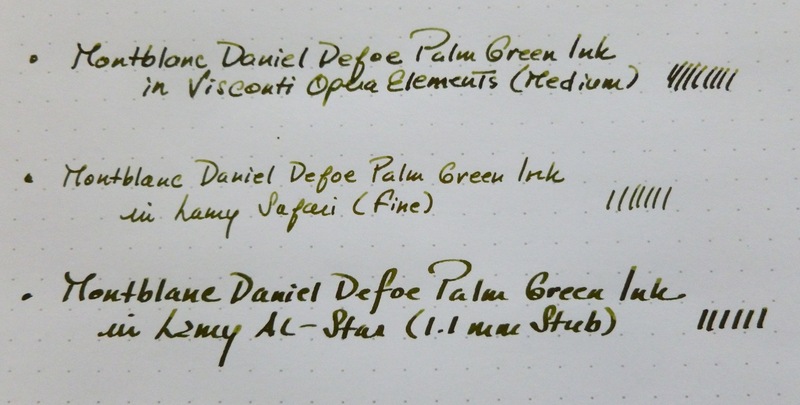 The same goes for Montblanc’s Daniel Defoe Palm Green ink. To call it simply green would be a mistake as this is an ink full of shading and surprises. To be honest, I’ve been fiddling with this review for a bit, and I finally figured out why. Reviewing ink is a tricky thing as accurately portraying an ink’s color is affected by so many variables— outdoor light and indoor lighting, nib size, particular pen characteristics with regard to flow, paper choice, camera settings and performance, computer display parameters, etc. I worried about “getting it right.” I think it’s been particularly tricky with this ink because it keeps looking different to me, which, of course, is something to celebrate, not fret about. 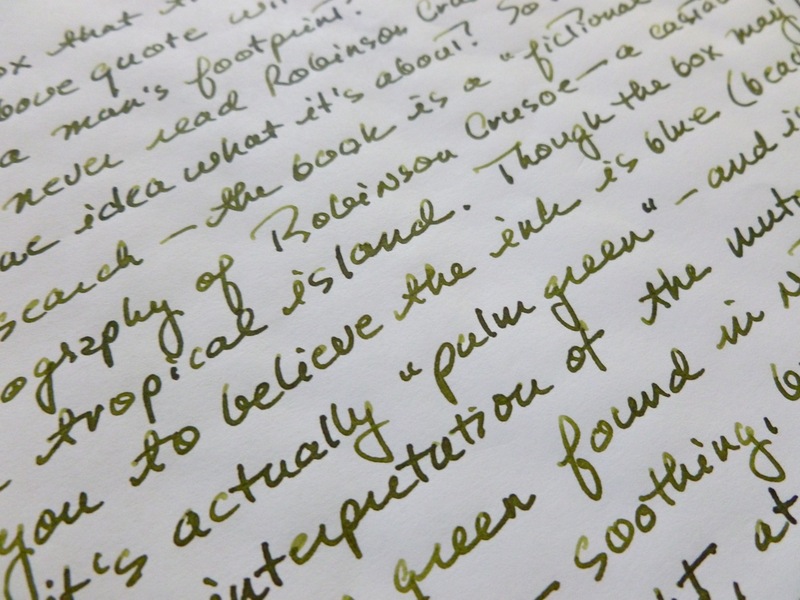 I wrote my first draft with my Visconti Opera Elements (medium nib), and really loved the way the natural looking green shades from a grassy light green to a deeper earthy olive shade. The ink is easy on the eyes— soothing but not boring. This is an organic green— very natural, very fresh. Wanting to test out the ink in a different pen with a different nib, I loaded up a Lamy AL-Star with a 1.1 mm stub and wrote another draft on a Rhodia dotPad. 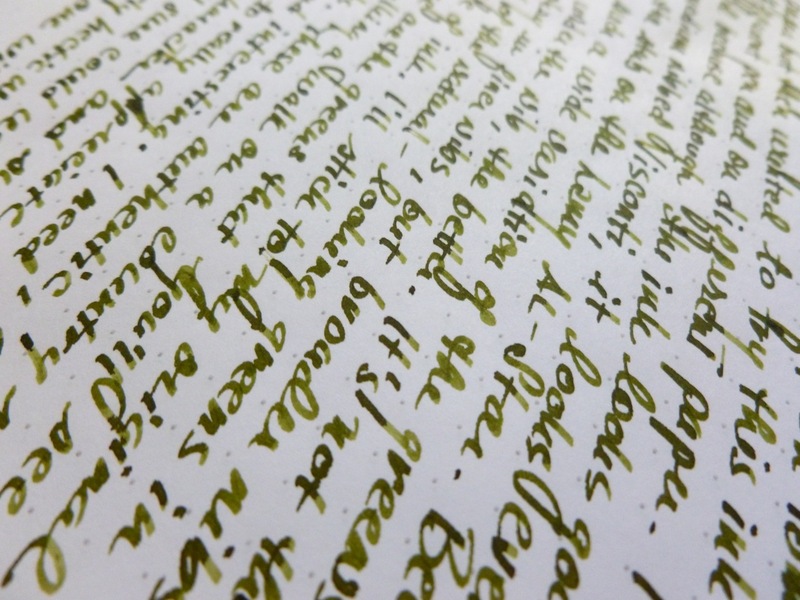 Though it’s a perfectly nice looking green in a fine nibbed pen, the plucked-from-nature shading truly reveals itself in pens with broader nibs. 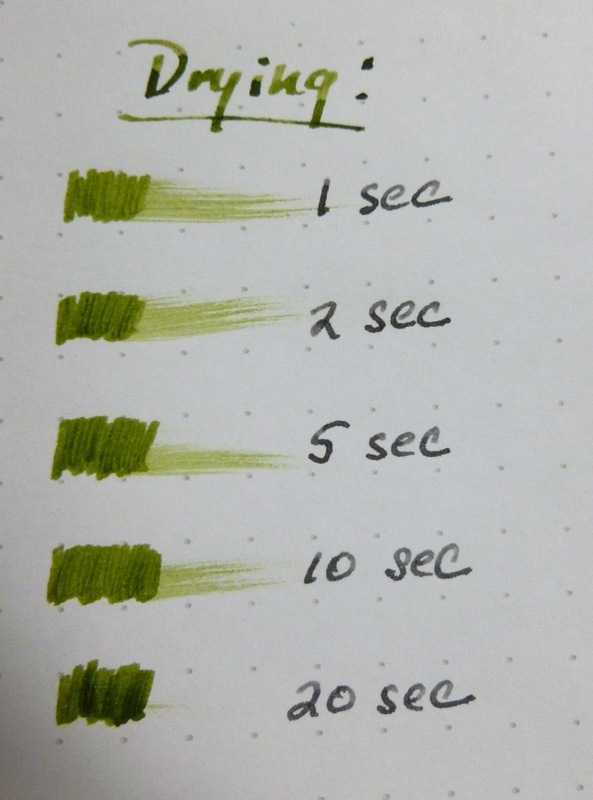 The ink seems to have a little bit of a longer dry time than other inks I’ve used recently, so I ran a quick test, and my results seemed to bear out that impression. Again, dry time can be affected by so many things— paper, ink flow, humidity, etc.— so don’t take my results as gospel. 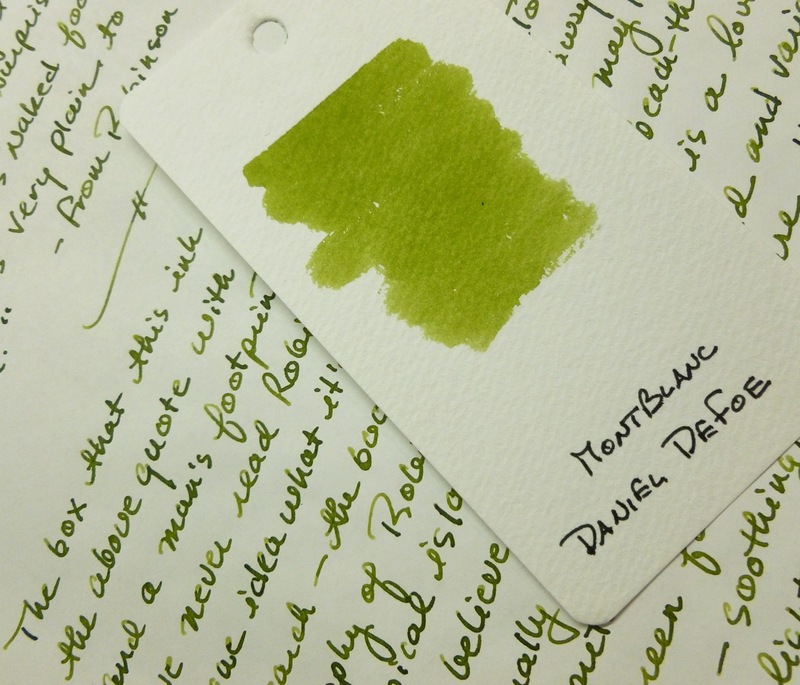 Montblanc’s Daniel Defoe Palm Green is aptly named as it calls to mind a tropical island with lush verdant foliage. 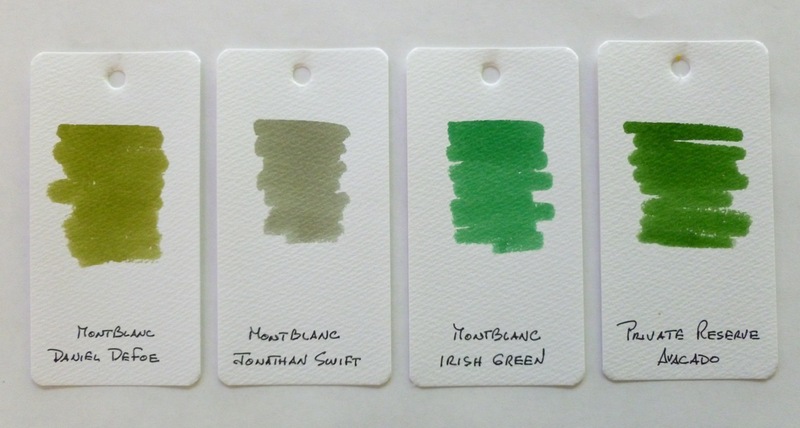 The shading in this ink is equally lush and celebrates the range of greens seen on mountain trails, in seagrasses, on tropical palms, and in meadows. It’s complex and full of surprises— just like nature. 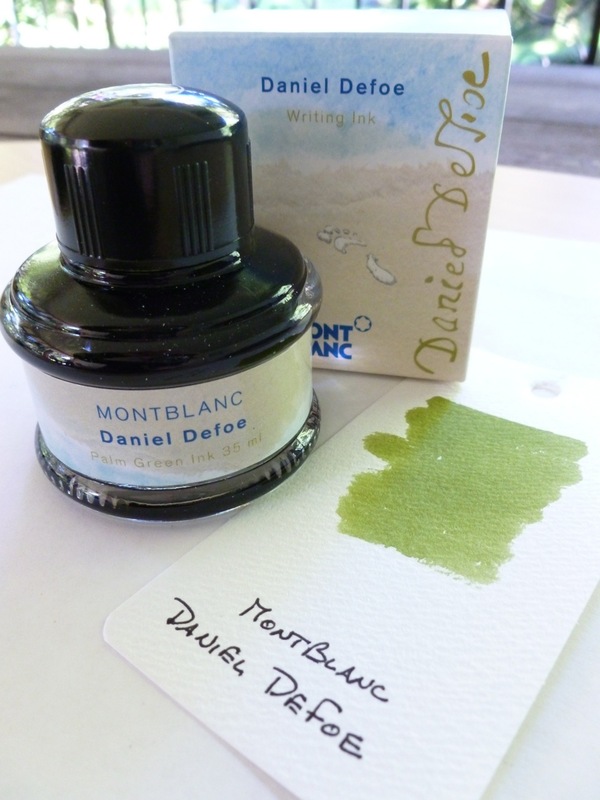 Pen Boutique is selling the Montblanc Daniel Defoe Palm Green ink for $19. Not a bad price for a mini-tropical vacation! For another take on the same ink, check out Ana’s review HERE.